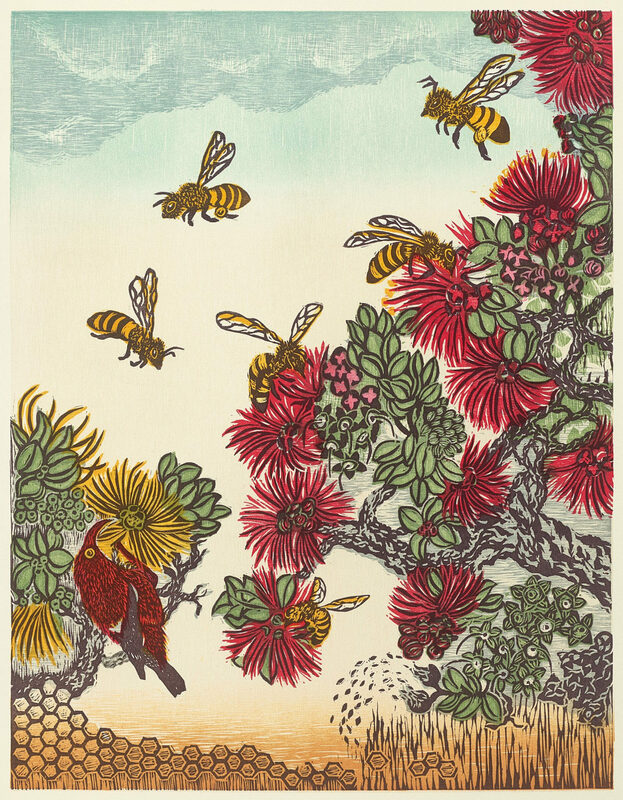 In this image the ʻiʻiwi bird, a Hawaiian honeycreeper, and honeybees gather nectar from the brushy lehua flower of the ʻohiʻa tree. Lehua honey, a favorite with Hawaii residents, is beautiful creamy white with a delicate flavor that crystallizes into a solid form. Historically the ʻohiʻa is Hawaiiʻs most abundant tree, found in many ecosystems, and is essential to the well-being and integrity of native forest ecosystems. ʻOhiʻa are polymorphic. They grow in a variety of forms and ecosystems, and they exhibit great genetic diversity. The flowers range from orange, yellow, pink and red. Recently ʻOhiʻa on the island of Hawaii have been infected by a fast-spreading fungus that has already caused thousands of acres of this precious tree to wilt and die suddenly. Their genetic diversity seems to give some trees immunity to the fungus. Scientists and residents are engaged in research and many kinds of remedies to slow down the progress of this disease and preserve the ʻohiʻa. This image depicts the full range of development of the lehua flower bud, blossom, the seed capsule dispersing the tiny seeds in the wind and the dried empty seed capsule. The female worker bees are shown flying to the flowers and then leaving after gathering nectar, with a full load of pollen attached to their legs, returning to the hive to deposit these goodies. This is a multiple-block original woodcut printed on a handmade paper. To learn more about Big Island Bees visit bigislandbees.com.